Cars baffle some of us. How a car works is even more mystifying. A lot of us get in our cars every morning, expect it to start up right away, take us to point A and then to point B and point C, and then return us safely home after our journey. We expect our car to do this day-in, day-out, 365 days a year, for many years. Where we run into trouble is when we get in our car, and it doesn’t start. One culprit may be a dead battery, which eventually needs replacing on all vehicles. Lee’s Towing, the best tow truck company near Fort Collins, CO, will explain how to jump start your car’s battery should your vehicle ever not start. First off, you’ll need two vital things: another car and jumper cables. You can’t jump start a car without both items. Usually, a second person is involved as well, likely a good Samaritan who will offer to help you out or a neighbor if you’re at home. One warning: If either vehicle has an electronic ignition system or is an alternatively fueled vehicle, the use of jumper cables may damage it. Jumper cables. Along with a good first aid kit and tool kit, you should have a pair of jumper cables in your vehicle at all times for just such a situation. Make sure both cars are not on and are not touching. Before you attach the cables, make sure both vehicles are in park or neutral and both ignitions are off. You may want to engage the parking brake as well in both vehicles for added safety and accidental rolling. Take the key out of your car, so your car can’t start up when the jumper cables are attached. This protects from power surges and electrical shock. Before you begin, check the voltage on the batteries, which should say something like “12V.” The live battery needs to match the dead battery or else a dangerous electric current can be transmitted that burns out the car’s systems. One thing to look for is similar sizing as batteries with similar voltages will be the same size. Still look for the voltage on the label to avoid possible damage. If you are unsure, error on the side of caution and find a different good Samaritan or call a tow truck if need be. You don’t want a simple problem be compounded. Jumper cables are usually color coded and have “+” signs and “-” signs (plus and negative) on them. If you look at your car battery, your battery should have “+” sign or say “POS,” which stands for positive. Attach one of the red clips to the positive sign. On some vehicle models, you may have to remove a plastic cover from the positive battery terminal before you can connect the jumper cables. You remove this protective cap by twisting it counterclockwise by hand. Attach the other red clip of the jumper cable to the other positive terminal of the car battery. An easy memory tip is the red is matched to the red and the positive to the positive. Attach one of the black clips to the “-” terminal, or negative side of your car battery. Attach the other black clip to an unpainted metal surface on your car that isn’t near the battery. This grounds the battery, which makes it easier and more effective when charging as it provides a more direct return path to the good battery which is powering the dead car. Furthermore, if you connect to the battery, sparks can ensure, igniting hydrogen fumes after the car is turned on. Also, make sure the jumper cables are not hanging down into either vehicle, so nothing gets tangled or caught by moving parts. Now, the good Samaritan will start his or her car and should let the engine run for a few minutes to charge your battery. Try to start your vehicle. If your vehicle won’t start, check the cables and make sure they are connected securely and properly. Run the other car for a good five minutes or so before trying to start your car again. If your car still won’t start, then you have a bigger problem than a dead battery, such as a blown fuse or a faulty starter. Once the jump works and your car starts, you are okay to disconnect the jumper cables. You’ll want to disconnect the cables in the reverse order you connected them in. Start with the negative grounding cable you attached to a metal part. Remove the black clamp, followed by the red clamp, on the donor battery. Finish by removing the red clamp on the newly-charged battery of your car. When disconnecting the cables, make sure the clamps do not touch until all of them have been removed from both batteries. Accidental contact during any stage of this process can cause electrical damage to either one or both vehicles. Don’t shut off your engine. You’ll need to leave the car running at least 15 minutes to recharge your battery. If you shut your vehicle off too soon, you’ll need another jump start, defeating the purpose of the first jump start completely. 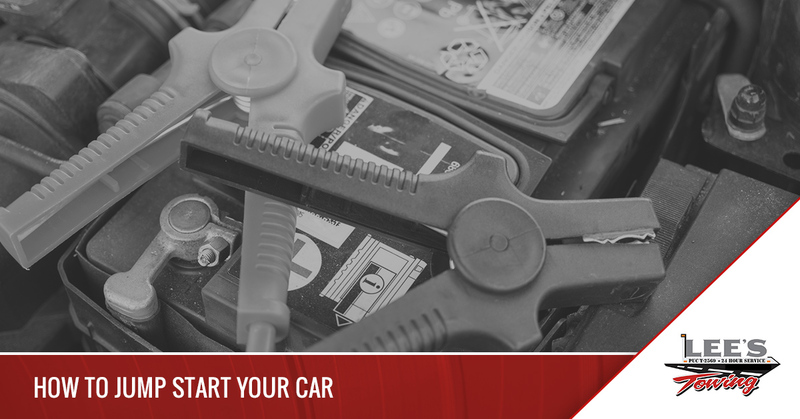 If your car won’t start the next time you go to use it, the battery isn’t holding a charge and needs to be replaced. Jump starting a car takes practice. If you are unsure or are uncomfortable, you can give Lee’s Towing near Fort Collins a call. We offer jump start services along with all of our other towing services, which include light duty towing, heavy duty towing, impound services, and emergency roadside assistance. Call us today for all of your tow truck needs! ©2018 Lee's Towing - Do not copy. All rights reserved.